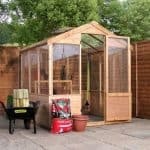 The modern and stylish Waltons Evesham Wooden Greenhouse is an excellent choice for both the amateur and keen gardener. It offers substantial height thanks to the water-resistant apex roof. 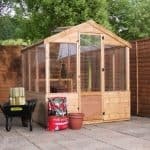 Combining high quality shatterproof styrene glazing with a thick tongue and groove design, this greenhouse is sure to last a very long time. The glazing is also UV protected. 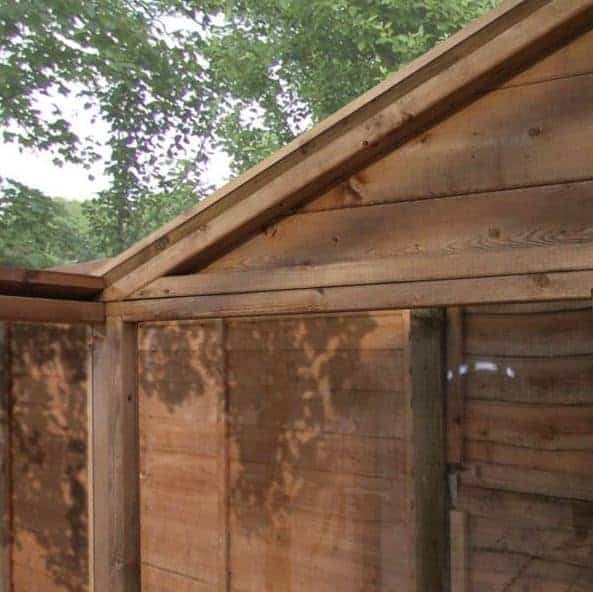 This ensures that your plants don’t get damaged by strong UV rays and that the wood doesn’t discolour or crack over time. A single door fitted with a turn button catch is included in the design. It is worth noting that this door is a little thinner than standard. So getting wider equipment into the greenhouse isn’t going to be easy. 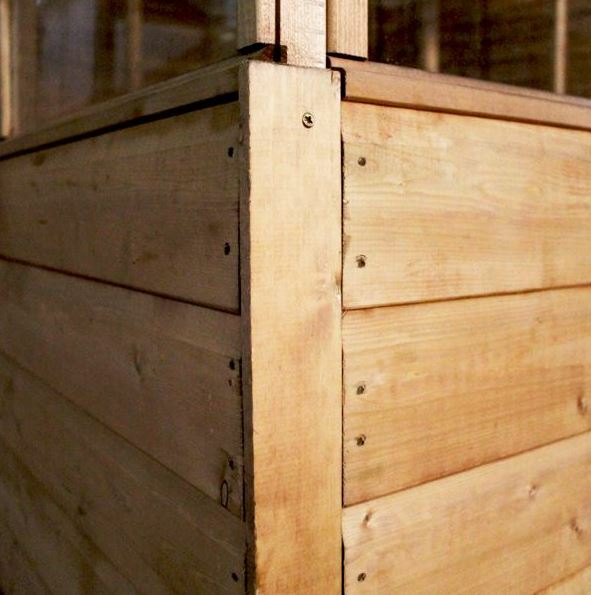 The wooden part of the greenhouse is made from 12mm tongue and groove. So quality is guaranteed and this is backed by a 10 year anti-rot warranty. One of the most important features of any greenhouse is the ability to regulate the temperature. That’s why the manufacturer has added an opening roof vent. So on really hot days, the vent can be opened to get a good circulation of air into the building. Overall this really is a superb model that offers an excellent alternative to the average greenhouses found on the market. Does require annual treatments so compared to non-wooden greenhouses, it does need to be well-maintained. However, you are rewarded with an attractive, durable building. 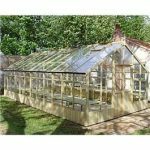 This is a half glazed, half wooden greenhouse with an extra tall height making it suitable for growing tall, climbing plants. It is one of the smaller models available which makes it ideal for most gardens. Most of its measurements are above average including the height of the door as well as the roof. However, the door’s width is a little on the slimmer side. This means it isn’t really suitable for transporting wide equipment such as a wheelbarrow. However, it still provides a generous width to get in and out of the greenhouse comfortably. An apex roof is added, though like most greenhouses it has a fully glazed design. This is to allow light to enter the top of the greenhouse, giving your plants the maximum amount of natural sunlight possible. The apex feature adds excellent interior height and also gives the building great rainwater protection. Within the roof there is an opening vent which also allows you to ventilate the greenhouse in very hot weather. To allow you to water your plants inside the greenhouse, there isn’t a floor. Another benefit of this is that you can store very heavy equipment. However, this does make it imperative to build the greenhouse on top of a concrete base. It needs the stability of a level, firm base so if you don’t have concrete in the garden, you will need to place paving slabs down instead. This greenhouse has a unique construction. Most tend to have a fully glazed design. However, in order to provide a better quality, more attractive building, the manufacturer has created a half wooden and half glazed design. It still allows more than enough light to filter through to your plants as the roof is also glazed. However, it provides more weather resistance and security than the average fully glazed greenhouse. 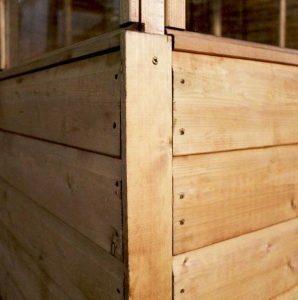 12mm tongue and groove has been used in the wooden construction. This creates an interlocking, wind-proof and waterproof design. The attractive panels also have a little groove, directing rainfall away from the building and increasing its rot resistance. It has a thick, sturdy frame and comes with a great 10 year anti-rot guarantee. Treatments will be required in order to benefit from this guarantee however. So this will need a little more maintenance than standard fully glazed metal greenhouses, but it is definitely worthwhile. You will need to apply treatments every year to make sure it stands the test of time. As mentioned earlier, the door on this greenhouse isn’t as wide as the ones found on most standard models. However, it still gives you plenty of room to manoeuvre comfortably in and out. It has the same half glazed, half wooden design as the rest of the building and due to its solid build it isn’t likely to sag over time. It is also fitted with a butterfly catch to stop the door from opening in strong winds. All of the glazing is created with shatterproof styrene. This means it is going to be harder to break than glass and if it does, the plastic won’t shatter and cause injury like glass would. It has been UV treated so it will not crack or fade and your plants will also be safer from strong UV rays. 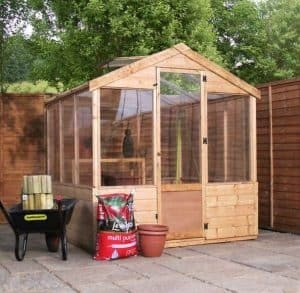 This greenhouse is purely built to store plants and non-valuable gardening tools and equipment. Therefore it doesn’t come with any built in security. There are some greenhouses available that offer a more secure design, but this isn’t one of them. Of course, the reason for this is because very few thieves ever target greenhouses. As long as you don’t store anything valuable in here you won’t have to worry. You can also add your own security by attaching a hasp and staple or pad bolt and then a padlock, though it will require minimal DIY skills. 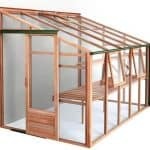 You have one customisation option and two extras available with this greenhouse. The customisation option is to switch from the standard opening vent to an auto vent. What’s great about this option is that it is really affordable yet it offers such great benefits. The auto vent can be set so that it automatically opens at certain temperatures. This allows you to properly regulate the temperature within the greenhouse, even when you aren’t home. As all gardeners know, some plants can be more difficult to maintain than others. They require specific temperatures in order to thrive. The UK weather is very unpredictable and temperatures can change significantly throughout the year. You aren’t always going to be home when they do. So the automatic vent makes it easier to keep your plants thriving all year round. It is very easy to install and should take just a few seconds to add to the greenhouse. It can also open up to 14 inches. The auto vent is great for regulating the temperature during the warmer months, but what about winter? The Lifestyle 1.9kw greenhouse gas heater could be the solution. It provides an economic way to make sure your plants get the heat that they need throughout the colder months. Finally an installation service is available if you’re not too keen on trying to install this greenhouse by yourself. You will need to make sure the base is fully prepared before the team arrive. However, they will take care of everything for you from installing the building to cleaning up afterwards. The quality of this greenhouse is spectacular. Both the wooden and glazed parts of the building have been constructed with high quality materials. This is one of the longest lasting greenhouses on the market, though it does require more maintenance than simple metal models. However, the benefit of this is that you receive a 10 year anti-rot warranty. It isn’t the most spacious greenhouse available, but it does offer a lot of internal height. Both the amateur and keen gardener should find it provides more than enough growing space to fit their needs. Though this is going to be slightly harder to assemble than the more simplistic metal greenhouses available, it does come with full instructions. It shouldn’t be too hard to install but if you’d prefer there is an installation service you can take advantage of. The attractive design, excellent features and strong rigid build of this greenhouse make sure you are receiving outstanding value for money. 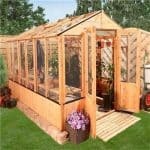 Final Thoughts: Looking for a greenhouse that will add both style and practicality to the garden? 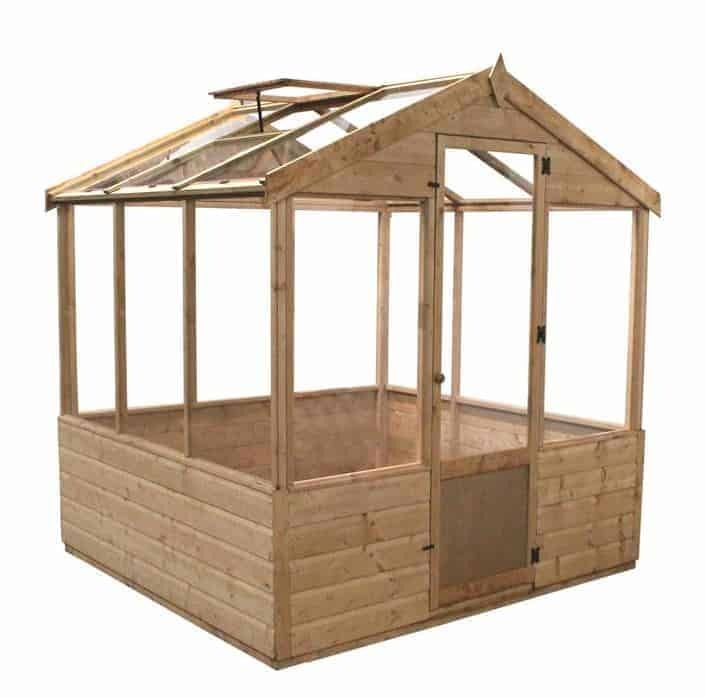 This Evesham wooden greenhouse is a fabulous choice for any gardener. Offering a compact design it should fit into most gardens. It offers a half glazed, half wooden design that makes it really stand out from the crowd. Like most greenhouses, this one is built with UV protected polycarbonate glazing. It is best known for its shatterproof benefits and makes it a safer choice than glass. 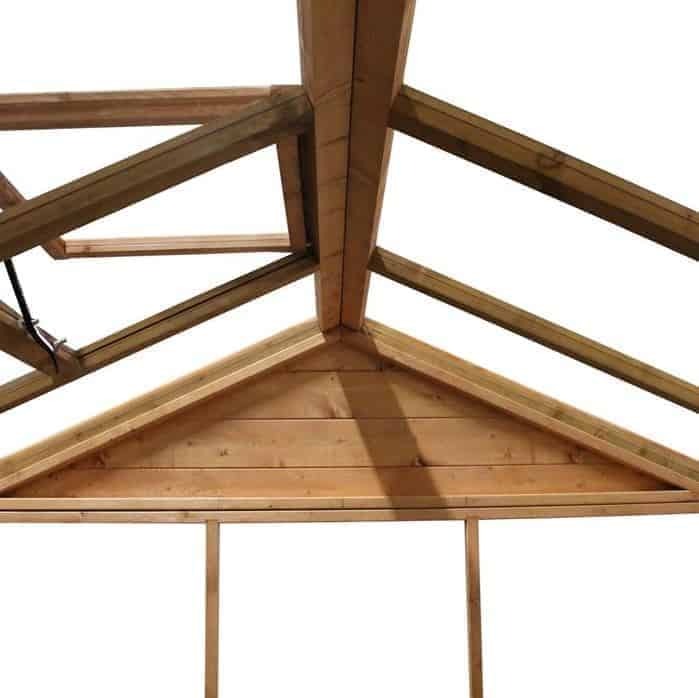 A 10 year anti-rot warranty, opening roof vent, 12mm tongue and groove construction and tall apex roof are just some of its best features.